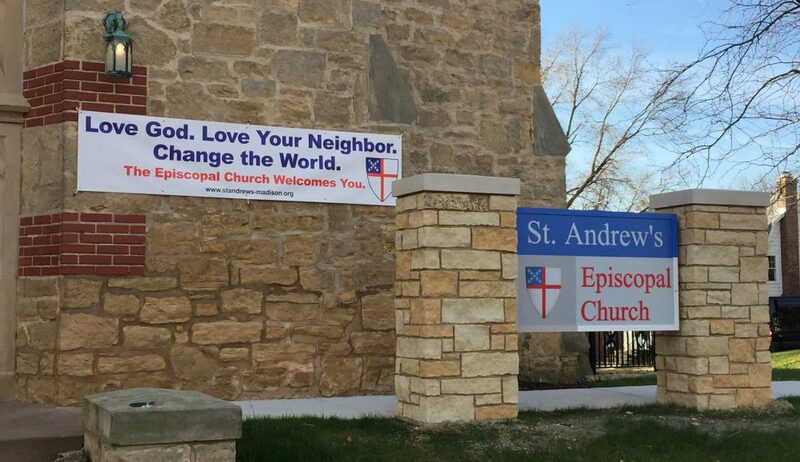 This sermon, offered at St Andrew’s Episcopal Church in Madison Wisconsin on August 19 by The Rev. Andy Jones is built around the readings assigned for Proper 15A in the Revised Common Lectionary. Here is a recording of the sermon as delivered at the 9:30 am Eucharist. So, I would hazard a guess and say that probably everyone in the room has seen this happen to someone else. And I would guess that for most of us, in fact I would have to say that I hope and pray that in fact all of us, have had this experience. Now it may be when the conductor’s baton drops for the first beat and that first chords swells out of the orchestra. It may be when you hit the right button on your car radio and that one song starts to play. Maybe it happens when you’re walking through a gallery and suddenly you are arrested by a piece of art that you never seen before, or you hear someone reading a poem that takes your breath away and makes you stop. In those moments there’s something that transports us out of time into a place where everything else just seems to go away, and all we can do sit in that moment and feel the deep connection to the truth to which that piece of art points something; beyond the orchestral piece or that piece of music that was popular the first time you fell in love; that points beyond that painting that’s hanging there on the wall in two dimensions, or the voice of the person reading that poem. Somehow in that moment we are connected with something bigger, broader, more awesome, even universal or eternal, that we weren’t aware of just the moment before. We come in here every Sunday and we have a moment just like that together. It’s that moment when the person behind the altar holds this up (holds up a host). We call this a sacrament. And the definition of a sacrament is “an outward and visible sign of an inner and spiritual truth.” And just like those pieces of music, or that piece of art, or that poem, point to something beyond themselves, this piece of bread points to a truth and a story that stretches back to the beginning and forward the end of time. It tells a story that’s beyond our imagination and often beyond our understanding. And so, we have this tangible physical thing to help us to remember that story. So, what is the story to which the bread points? We’ll start with some poetry. “In the beginning when God created the heavens and the earth, the earth was a formless void and darkness covered the face of the deep, while a wind from God swept over the face of the waters. Then God said let there be light and there was light. And God saw that the light was good…” (Genesis 1:1-4a). “Let us make humankind in our image according to our likeness… so God created humankind in God’s image. In the image of God, God created them; male and female God created them…” (Genesis 1:26a and 27). God speaks and we come into being. We become, we are, because of God’s word. “Let the same mind be in you that was in Christ Jesus, who though he was in the form of God, did not regard equality with God as something to be exploited, but emptied himself, taking the form of a slave, being born in human likeness” (Philippians 2:5-7). And then moving to the beginning of the gospel from which we heard today, the sublime poetry of the prologue to John. “In the beginning was the Word, and the Word was with God, and the Word was God. He was in the beginning with God. All things came into being through him, and without him not one thing came into being. What has come into being in him was life, and the life was the light of all people” (John 1:1-4). “…the word became flesh and lived among us” (John 1:14). This piece of bread points to an amazing and astounding truth. A truth that is a stumbling block and an obstacle to lots and lots of people. That truth is that the God who created all things, God, holy, set apart, separate, different; God transcendent, God whose surely lives somewhere other than this profane world… that God comes among us as one of us, and takes on our flesh! That word, that word that created all things becomes flesh. That was a scandalous thing to say in Jesus’s time and it’s a scandalous thing to say today for a lot of people. But it’s the truth to which we cling, the truth that we proclaim and the truth that gives us hope. And has John says here in his Gospel the truth that gives us life. Jesus says to us in the gospel today that his flesh is life, that we have to eat his flesh in order to have eternal life. Jesus is standing then in the long line of scriptural poets and John is quoting Jesus in this way, pointing back to this truth that this bread represents and makes manifest in our presence. We need to take in, to ingest, to internalize, to incorporate into who we are the story, the truth, to which this bread points; that God loves us so much that God is willing to come among us, and walk in our midst, and to put Gods self into our hands. We tell that same story every Sunday as we consecrate the bread and wine. Listen to the Eucharistic prayer this morning and you’ll hear all of salvation history rehearsed, from the creation through the fall; through the incarnation, life, death, and resurrection, of Jesus. And we say those prayers over this bread to imbue this bread with that truth; the truth beyond the physical details of what I hold in my hand. Jesus wants us to make that truth so much a part of our lives that we never forget it. The problem is that we walk out of this place and there are signs all around us to point to the opposite: that God doesn’t love us, that God is not here, that God doesn’t really have a hand in the world around us anymore. And so it’s easy to forget. In John’s day when he wrote his gospel, we think between the year 90 and the year 110 A.D., there was this conflict in the community. How important is the Eucharist? Do we really need to show up every week, and eat this bread, and drink this wine? And John is quoting Jesus here to remind them how important this is. To pointed it out, that without this reminder you’ll forget, you’ll lose track, and the joy, and the life, and the hope that this truth brings to you might be lost. So in order to continue to live in that eternal life you need to gather. You need to come together, to hold one another up, and to receive this outward and visible sign of the inner and spiritual truth that is yours always. Of course, that’s not the end of the story. Because what Jesus wants for us, and what God wants for us, and what our collect today asks for, is that as we consume Jesus’s flesh and blood, the bread and the wine, an outward and visible sign of that liberating life-giving truth, we ourselves will be transformed and become a sacrament to the world in and of ourselves; an outward and visible sign of the truth that God loves all of us, that we are all worthy of dignity and respect, that we are all beloved and welcome in God’s presence, always and forever. You can’t, you can’t come forward every week and receive this sacrament and not be changed. After all, you are what you eat… right? So, when you come forward this morning and hold out your hands to receive this bread, remember what this is. This is the flesh of Christ. And the flesh of Christ is the word of God. And it is the word of God that spoke all things into being, that created all that is, and gives life to the world around us. Know that that gift, that gift is yours, mine, ours. It belongs to everyone. And as you stand up and go back to your seat, and prepare to conclude our time together, and go out into the world, feel that sacrament working within you. And ask yourself, what can I do this week to be an outward and visible sign of the inner and spiritual grace which is the truth of God among us always? This entry was posted in Eucharist, sermons by Andy Jones. Bookmark the permalink.